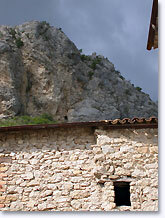 Departement of the Drome - Provencal Drome - Pop. : 400 inh. 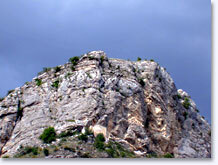 - Altitude : 880 m.
39 km from Sisteron via the D946 and then D546. Séderon is a humble Provençal market town, which you might drive through without really seeing it, were it not for its strange location, lying between two rocky cliffs, at the meeting point of the Alpine and Mediterranean landscapes. 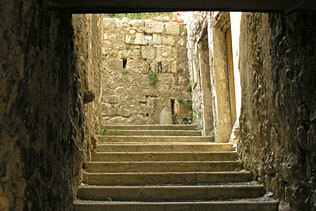 Séderon was originally built in medieval times on the rock that now overlooks the village. At one time it was the stronghold of the famous Raymond de Turenne who during the 14th century devastated Provence and Dauphiné due to an inheritance dispute. Overlooked by the rocks of La Tour and Le Crapon that close off the valley, leaving a narrow gully for the river Méouge to flow through, Séderon is a natural crossing place between Provence and Dauphiné, and as such was an important trading centre for many years. Surrounded by arid land on the mountainsides, in summer the village is cooled by the impetuous Méouge, and is a magnificent sight in the midst of intense blue lavender fields, golden wheat and broom, and fragrant limetrees under utterly blue skies. 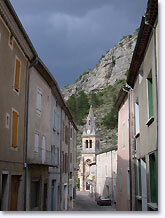 In winter Séderon becomes a “little Siberia”, very sunny but with temperatures that are often severe at this altitude. 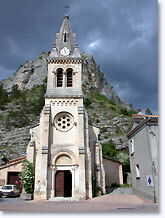 Ruins of the Notre-Dame-la-Brune chapel abandoned in the 16th century. or for Crête de Négron - Jambard (easy with magnificent view). Les Omergues (8km) and Saint Auban sur l'Ouvèze (17km).